I first tried this stuffing a few years ago, and it fast became our family's favorite. Hearty corn bread mix is flavored with mushrooms and bacon." In a large skillet, cook bacon until crisp; remove with a slotted spoon to paper towel. Drain, reserving 2 tablespoons of drippings. Saute celery and onion in drippings until tender. Add mushrooms, sage, salt and pepper; cook and stir for 5 minutes. Remove from the heat; stir in the stuffing, celery leaves, parsley and bacon. Combine eggs and broth. Stir into stuffing mixture. Spread in a greased 13x9-in. baking dish (dish will be full). Dot with butter. Cover and bake at 350Â° for 30 minutes and stuffing temperature reaches 165Â°. Uncover and bake 10 minutes longer or until lightly browned. Yield: 13 cups. 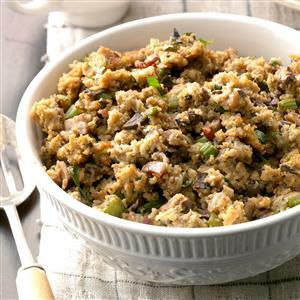 Editor's Note: Stuffing may be baked in one 16- to 18-pound turkey or three 5- to 7-pound roasting chickens.